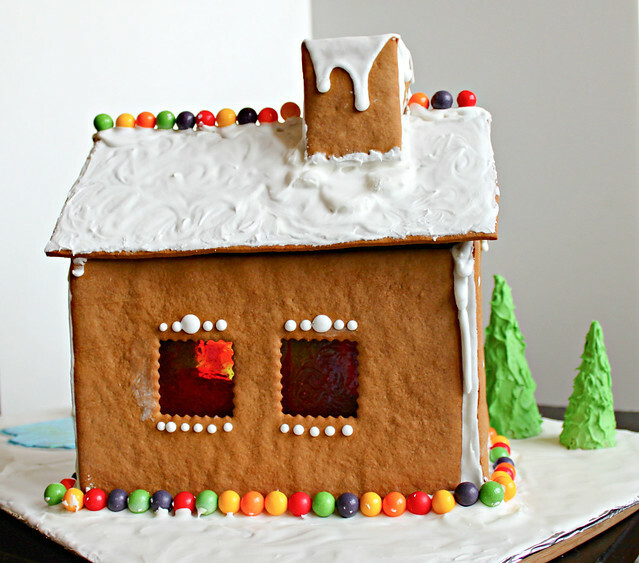 For some reason I got the crazy idea to make a gingerbread house completely from scratch. 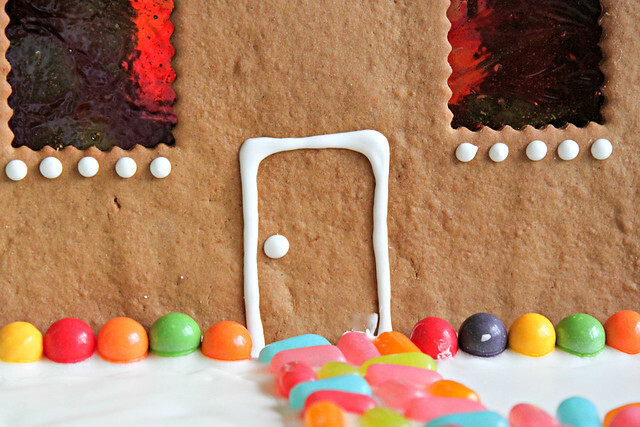 I had been thinking about it for a couple of weeks, but when I saw Coleen’s post (from The Redhead Baker) about making a gingerbread house, I finally decided I was going to make one as well. Coleen did such a wonderful job with her gingerbread house that she got an honorable mention in a local gingerbread contest. She made hers into a bakery and she even put cakes in the windows--how cute is that?! I knew mine wouldn’t be as great as Coleen’s but this was my first time making one and I think it turned out pretty well! 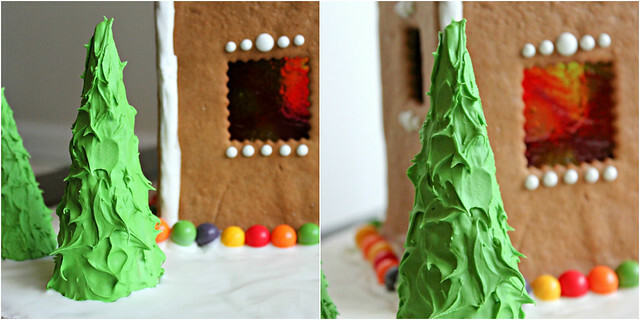 I used King Arthur Flour’s gingerbread recipe as well as their template. I will definitely use their gingerbread recipe again next year. 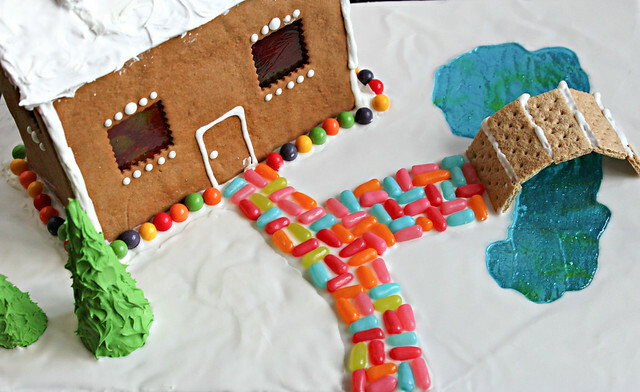 Their template was very helpful, and if I decide to make the same style gingerbread house next year I will probably use it again. No matter what template you use, I recommend you remeasure after printing to ensure everything is the size it is supposed to be--I had to make a few adjustments to mine. I decorated the sides of my gingerbread house before putting everything together--which I think is much easier than decorating it after the house is constructed. 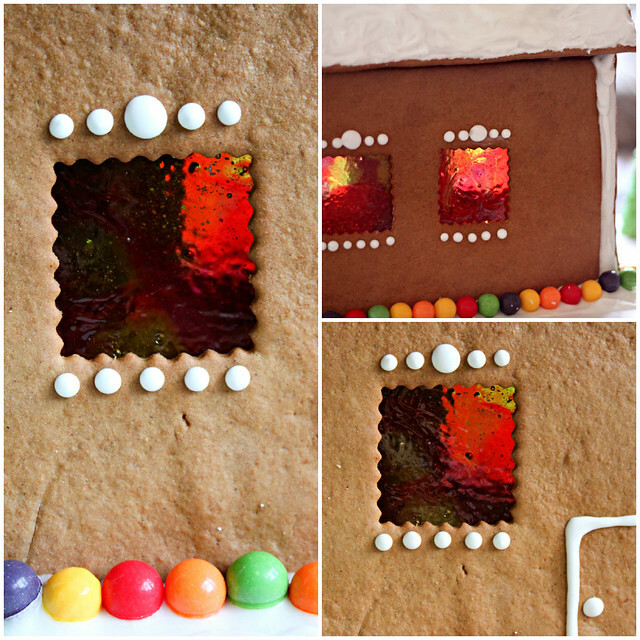 I also used jolly ranchers to make my windows. I “glued” them to the inside of the wall and let them set overnight. I thought the windows were especially pretty when the light hit them. 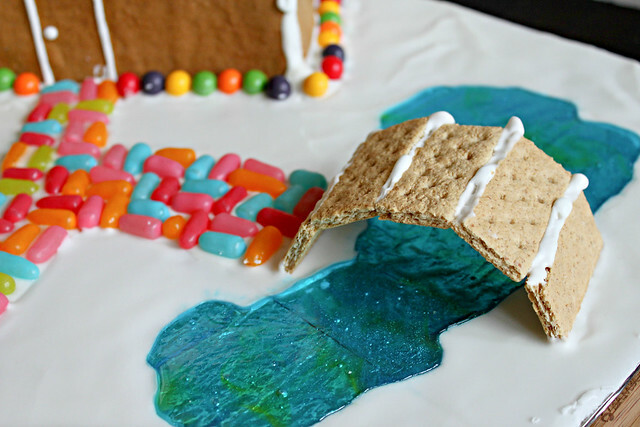 I also made a pond/stream using jolly ranchers and a bridge made with graham crackers to go over the pond. For the trees, I used upside down ice cream cones. I colored some of the icing green and then used a the back of a spoon to get the “leaf” like texture. I tried putting some cotton candy at the top of the chimney to give it a smokey effect, but decided that I liked it better without. I used Mike Ike’s to make the path to the door and the bridge. I also used Gobstoppers on top of the house and all around it as well. Overall I had a wonderful time putting it together and will definitely be making another next year! In the bowl of a stand mixer, combine brown sugar and molasses. In a small bowl, combine 1 cup flour, baking soda, ginger, cinnamon, and salt. Set aside. In a small saucepan, add the buttermilk and butter. Heat until butter is melted. Add the buttermilk mixture to the brown sugar mixture. Beat in the egg. Add the flour mixture to the wet ingredients and stir until combined. Slowly add an additional 1 cup of flour at a time until mixture comes together and you have a smooth, stiff dough. Divide the dough in half. Place each half in a large gallon size ziploc bag. Roll the dough in the ziploc bag until it is flattened. Refrigerate the dough for at least an hour. Remove one of the bags of dough from the refrigerator. Divide the dough in two pieces and return one of the pieces back to the refrigerator. Lightly flour a large piece of parchment paper to roll your dough out on. Any other pieces you might want, such as chimney, people, trees etc. Repeat with the remaining dough until you have all the pieces you need. Bake for approximately 15-20 minutes or until the edges just begin to brown. Remove the pan from the oven and place on a wire rack. Allow to cool for 10 minutes. After 10 minutes, run a spatula under the pieces to free them from the baking sheet. Allow to cool completely on the baking sheet. Combine all ingredients in the bowl of a stand mixer. Beat for approximately 5 minutes. For stiffer icing, use a little less water. For thinner icing, use a little more water. You will need a large stiff board to have as the “foundation” for your house. Pipe a generous amount of icing along the bottom of one of your long wall pieces. Place it on your board and either hold it there for a few minutes or use something to help prop it up. Pipe more icing along the back of the wall piece to help reinforce it. Next pipe icing on the bottom and side of an end wall. Attach it to the previous wall. Repeat with the remaining wall pieces until you have a 4 wall-house structure. For the roof, pipe icing along the end pieces and across the top of the long side wall. Place roof panel on icing. Pipe additional icing on the inside, as needed, to help reinforce the structure. To prevent the rood piece from sliding, use an object to help hold it up while it is drying. Wait at least an hour before repeating with the other roof piece. I used cookie cutters from a set similar to this one for the windows. 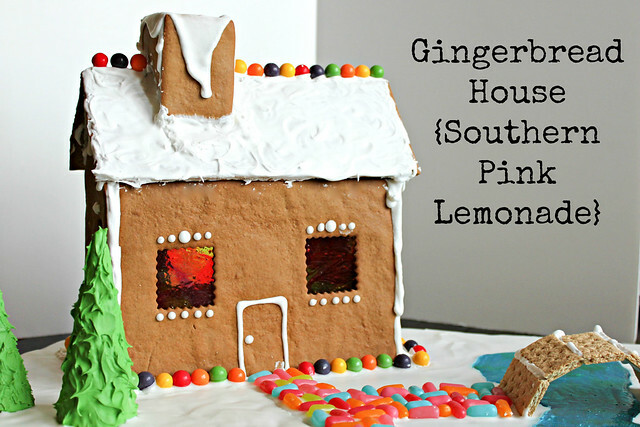 In addition to the King Arthur link listed below, I also found this post on gingerbread houses from Simply recipes helpful.